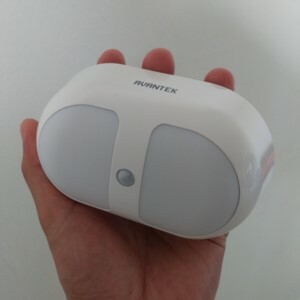 I had the opportunity to trial the Avantek motion-sensing LED night light in my home. I positioned it near my bed so it would activate when I randomly wake up in the middle of the night. This spot also ensures this Avantek night light gets a lot of action! So far, my experience has been positive. The Avantek night light requires 3 AAA batteries (not included). The back plate can be taped to the wall with the provided 3M double-sided adhesive pads. There is switch on the back that controls the behavior of the nightlight. There are 10 LEDs in this unit. Thankfully, LED bulbs use very little power, so having 10 LEDs shouldn't impact the batteries. And because this is battery powered, I don't have to mess with hiring an electrician to run a power outlet to dark spots in my home. Read more on Choosing the Right LED Night Light. I've been using this nightlight for a few weeks and I've made notes of what I like and dislike about the Avantek night light. "Auto" turns the LED lights on when the room is dark and motion is detected. The motion sensor is located right in the middle of the unit, which is the most optimal area for wide range motion detecting radius (3 meters and 120 degrees). "On" is designed so the unit can be utilized as a portable flashlight. Based on the location, I couldn't imagine any practical use for the "On" feature, but it's there if you ever need it. Taking the nightlight off of the back reveals the batteries, which is an odd design decision. If i were to drop the nightlight without the back plate, the batteries would wiggle loose. The light stays on for approximately 15-20 seconds. This is long enough to get where I need to go and then shut off to preserve battery life. It'd be nice to have the option to adjust the duration the night light remains on, but not having this feature isn't a dealbreaker (that would unnecessarily raise the cost of the unit). The build of the Avantek is with high quality plastics with all rounded edges (no corners). I would not mind locating this in a very common and public section of the house. "Naked" LED lights can sometimes be harsh on the eyes, but the Avantek's frosted covering over the front sufficiently softens the beam of LED light (a well thought out design). The one thing I dislike is the words Avantek right over the top of the unit. It would make the product cleaner looking. As can be seen, there are far more likes and dislikes for this product. I thorougly approve of the Avantek night light for use and for $8.99 on Amazon, it's a great deal for difficult to reach dark spots in your home. Disclaimer: I was given this product for a fair and honest review.